It's a proven fact that everyone loves to draw Hellboy. This was done years ago, and I don't know if Mike Mignola ever actually drew Hellboy with such hugely broad shoulders or if that's just how I got it into my head when I painted this. I would paint it very differently now but there was still enough that I liked about it to post it. 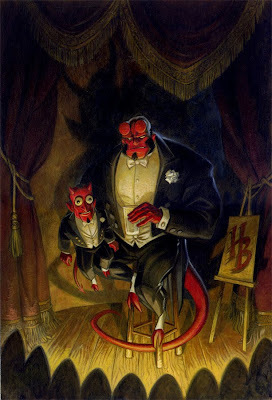 Here's a slightly recent-er Hellboy painting I did (still with the enormous shoulders, hmmm). Guess I should try him again sometime. The Hellboy Christmas special is in dire need of a reprint! Or a collected Toybox would be neat! Last I checked, I got a reasonably priced copy of Hellboy Christmas from mycomicshop.com - or at least reasonably priced for how rare it is, I think I paid around $15. A collected Toybox would really make my decade. Oh man that looks SO awesome! Hey Julian. That Hellboy is great. I love to paint on cardboard myself. So Shin and Choi is your work? It's very cool stuff. If you don't mind ask Sara to email me at my hotmail account. I haven't talked to her in a long time. Hope all is well. Fantastic painting. I love the moody lighting. Steve -- I drew this (off-model) Max a few weeks ago and promptly forgot about it. Sorry for spamming you with a link. I'm justifying it with the fact that it doesn't actually go to my site, so it's technically not a 'plug'. I am a huge, huge fan of your work. I met you at Comiccon last year and was a stammering mess. Love the blog, though!